Each selected country begins the compact development process with a thorough analysis of its economy aimed at identifying the most serious impediments to economic growth through their impact on private investment and entrepreneurship. This analysis includes the use of a series of diagnostic tests to identify which of several economy-wide constraints are most binding to private investment and entrepreneurship within a specific county’s context. This overarching analysis is further refined and contextualized through a targeted analysis of those constraints at the industry- or firm-level; and a thorough consideration of key social dynamics that could affect patterns of growth and poverty reduction, with a particular emphasis on the ability of disadvantaged groups to benefit from growth. This analysis, taken as a whole, is known as the constraints analysis at MCC. It forms a major component of the Preliminary Analysis phase. The constraints analysis is designed to provide each selected country with a clear central focus as it moves into later stages of the compact development process. The methodology that grounds this analysis provides a structured approach to economic analysis at the country-level that reflects the objective of facilitating private investment in economic activity in a manner that reduces poverty. Through a series of rigorous economic tests and analyses as well as cross-country comparisons, the methodology helps identify the “binding constraints” that most severely inhibit private investment and restrict the potential for long-term economic growth. MCC’s constraints analysis methodology further recognizes that the analytical process will produce robust findings only to the extent that it incorporates a wide variety of inputs. Thus, the MCC constraints analysis methodology incorporates additional data and information that reflect specific concerns about (i) social and gender inequalities that may characterize the economy or shape policies and institutions, thus affecting opportunities to raise incomes or alleviate poverty, and (ii) business and industrial performance issues that may influence contributions to job creation, private business activity and economic growth. Including these perspectives helps ensure that any conclusions about binding constraints are based on a complete understanding of the country’s economy and the potential impact of economic growth on poverty. At this early stage in the compact development process, the use of the decision tree below and its diagnostic questions helps a selected country maintain its focus on identifying, defining and analyzing problems, rather than leaping to possible solutions. It is not the job of the constraints analysis report to identify potential projects that would promote growth or reduce poverty. That said, it is relevant to include discussion and investigation of barriers to poverty reduction, access to growth or discriminatory policies and institutions where they arise in context of the constraints, as well as to note where constraints may affect certain sectors, industries, regions, or social groups more severely. This guidance document provides a brief description of the constraints analysis methodology, the inclusion of data and information that reflect specific social, gender and industry concerns, the identification of binding constraints, and the drafting of a final report, known as a constraints analysis report. These steps constitute the starting point for selected countries that seek to develop a compact for MCC assistance. MCC will provide each selected country a more detailed technical discussion of this methodology and its application. This chapter serves as a resource and guide for each selected country as it works to produce a constraints analysis that provides the analytic foundation for compact or threshold program development. After the constraints analysis is complete, each selected country will undertake a more comprehensive assessment of some or all of the binding constraints that the constraints analysis has identified and will ultimately design a compact or threshold program that includes a range of investments and other activities, including policy, legal, regulatory and institutional reforms tailored to address the binding constraints. MCC is founded on the principle that private sector-led economic growth is critical for achieving sustainable development that raises standards of living and improves human development. The constraints analysis builds on the premise that private investment – whether by individuals or firms, whether domestic or foreign – represents the primary engine for long-term, sustainable economic growth. Countries seeking to accelerate economic growth are faced with the fundamental question, “What constrains private investment and entrepreneurship?” The purpose of the constraints analysis is to identify the key problems that constrain private investment by firms and individuals and thus limit opportunities for economic growth and poverty reduction. The constraints analysis is based on a framework proposed in the seminal paper, “Growth Diagnostics,” by economists Ricardo Hausman, Dani Rodrik and Andres Velasco. Noting that the challenges of economic growth differ from one country to the next, they present an analytical framework that identifies the range of issues that constrain economic growth and helps prioritize among them. This framework allows policy makers, planners and development professionals to focus the limited political capital, institutional capacity and financial resources they command toward lifting or relaxing the most severe constraints, thereby generating higher levels of economic growth. While the framework is often referred to as a “growth diagnostic,” MCC generally describes it as a “constraints analysis” model or methodology. The social (overall) expected return on an investment, which is generally dependent on complementary factors of production such as infrastructure or human capital. The risks an investor faces and the resulting share of the return the investor can expect to keep. This is known as appropriability and is reduced by things like high taxation, crime, and macroeconomic instability. The cost and availability of financing the investment. Even when an investor has good projects with low risk, he or she still may not be able to invest without access to finance. The constraints analysis methodology then involves a series of diagnostic questions that are designed to test and highlight underlying issues that may constrain private investment in any country context. Using the decision tree as a guide, the methodology encourages systematic examination of each branch of the tree under these three broader categories to identify possible explanations for low levels of private investment and, in turn, low rates of economic growth rates. As an example, if evidence shows that the cost of capital is out of line with international norms, do the distortions stem from domestic financial markets or from external financial markets? Or, if evidence suggests that the returns to private economic activity are a concern, do the underlying issues stem from inadequate appropriability – that is, the opportunity for investors to fully capture or appropriate those returns – perhaps due to macroeconomic instability, “micro” risks like corruption, high taxation, weak property rights, discriminatory policies or institutions or failures in markets? Or, do the underlying issues stem from low social returns to investment, due to a lack of competitiveness or the insufficient supply of complementary factors of production, such as infrastructure or human capital? Aligned with MCC’s data-driven focus, the constraints analysis aims to produce robust findings by incorporating a wide variety of data from an extensive pool of reliable sources. 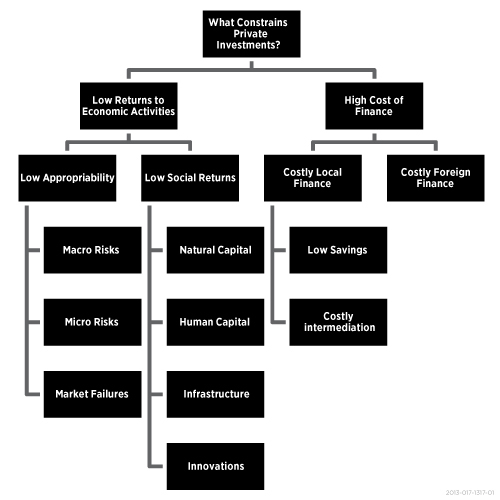 Using the decision tree, the selected country should strive to explore and identify the fundamental causes and issues that limit private investment and economic growth, rather than merely highlight the symptoms. As an example, the background analysis of the growth history of a country may highlight the importance of agriculture to GDP and historical income gains. The country may then present evidence that low agricultural productivity acts as a constraint to private investment and economic growth. Assessments of the agricultural sector often point to the lack of sufficient irrigation as the problem. While irrigation may be an issue, the constraints analysis methodology should push a selected country to look for underlying causes of inadequate irrigation, which might include low levels of human capital concerning cropping practices, poorly-defined or highly unequal property rights that limit investment in the land, or high levels of soil erosion. In this context, a focus on irrigation infrastructure alone might actually exacerbate underlying issues if they relate to poor management of ecosystem services provided by forests and watersheds. The use of investigation to dig deeper into face-value causes of problems is critical to conducting a good diagnostic. At each branch, the constraints analysis should consider the industry- or firm- specific manifestations of each potential constraint. Firm-level evidence can provide a more detailed understanding of potential constraints by highlighting their impact on the decision-making and behavior of private agents throughout the economy. For example, aggregate indicators might point to a shortage of skilled workers as a constraint, but only additional analysis would identify specific types of skilled workers needed (such as electricians or project managers). Table 1 provides some examples of how an industry-level lens (rows) can help contextualize economy-wide constraints (columns). Teams can use this lens to better understand how constraints identified by the diagnostic tests are experienced and constrain specific industries. Throughout the constraints analysis, a selected country should consider the social and gender aspects of the diagnostic questions and the available evidence. Such information generally leads to a more complete understanding of the context in which private investment and economic activity occurs. It may thus inform and strengthen insights related to economic constraints. As an example, low agricultural productivity may have social and gender dimensions with significant implications for efforts to improve agricultural earnings or reduce rural poverty. This may be the case where women farmers perform a high proportion of certain kinds of labor in the agricultural value chain but where social norms, policies and institutions systematically provide them lower levels of access to inputs, credit, and training. A strong constraints analysis methodology will consider such issues in its examination of underlying causes. Because the distribution of income gains from economic growth is important to MCC, the constraints analysis report should note whether particular constraints affect some groups more strongly than others. Ultimately, the constraints analysis methodology seeks to arrive at a well-developed understanding of the country’s experience with growth and poverty reduction, including economic sectors that have been or could be drivers of growth or poverty reduction; the constraints to growth in a logical way that accounts for the country’s specific growth context; and the potential for future growth and poverty reduction if the identified constraints were relaxed. While the methodology is not intended to produce an exhaustive list of all possible economic concerns, it may lead to the preliminary identification of a number of issues or concerns. Further analysis may be necessary to discern which have a greater impact or are of greater concern than others and to determine which constitute binding constraints to private investment and economic growth. To help focus the next phases of compact development work, the final constraints analysis report should identify a fairly small number of the most binding constraints. Binding constraints are those that, if relieved, would produce the largest gains in growth and entrepreneurship of any potential constraint areas. Not all areas can be binding. In MCC’s experience, the most common number of identified constraints in past constraints analyses has been three (3), and the average number of constraints has been 3.5. If the selected country identifies more, it will bear a substantial burden of proof to demonstrate that all constraints identified are truly “binding” in order to secure MCC’s agreement on the results. Using the constraints analysis methodology, MCC expects selected countries to identify the binding constraints to private investment and economic growth within roughly six months of being selected to develop a compact or threshold program (and generally within four months of setting up their local teams and starting the process in earnest). Furthermore, MCC expects that the selected country’s Compact Development Team will take the lead role in the design, planning and application of analyses and diagnostic tests that inform the results of the constraints analysis. MCC’s country team is available to provide guidance and support, advise the Compact Development Team on best practices for the execution of analyses and interpretation of data, and provide oversight of the process to ensure that it conforms with MCC’s internal standards of rigor and validity. The entire process involves several steps, as described in more detail below. Economist: (also discussed in Chapter 1) a senior economist who will lead the constraints analysis process, manage the day-to-day work and monitor the analytical work of the constraints analysis team, as well -as serve as the primary editor and author of the constraints analysis report. The economist will be the primary analyst responsible for designing and conducting the tests related to the identification of constraints, seeking alternative hypotheses, explaining conflicting data, and ensuring that the overall narrative of the analysis is logical, sound, and rests on as wide a body of reliable evidence as possible. The economist is expected to work closely with the social and gender specialist and private sector specialist to adequately incorporate relevant data and other information to deepen the analysis of important sectoral and social dynamics associated with each constraint. Social inclusion and gender integration specialist: (also discussed in Chapter 1) a senior sociologist or social scientist with experience in gender and poverty analysis who will assist in the collection and analysis of data disaggregated by social and gender groups, and policy and institutional analysis, and manage, in coordination with other members of the analytical team, consultations with representatives of different social groups. The role of the social inclusion and gender integration specialist during this process is to provide inputs into the constraints analysis that articulate and describe the differential impacts of constraints across relevant social groups and how poverty and inclusion are affected by each constraint. Private sector development specialist: (also discussed in Chapter 1) an experienced business policy or business development professional who will assist in the collection and analysis of business and industry data and manage, in coordination with other members of the analytical team, consultations with representatives of business and industry groups. The role of the private sector development specialist in this process is to provide input to the constraints analysis that identifies key economic sectors that could potentially drive future growth and poverty reduction and describes and articulates how development of these sectors may be hindered by the presence of the constraints. Analytical team: a small team of technically skilled economists, sociologists, political scientists or other analysts drawn from relevant government ministries (such as a ministry of finance, ministry of planning, central bank or national statistics office), from research organizations, think tanks or academic institutions, or from business organizations or the private sector and who have skills and experience gathering, cleaning and analyzing data and/or conducting rigorous qualitative analyses. Analytical team members may be appointed or hired on short-term contracts, based on availability and need. MCC encourages selected countries to staff their constraints analysis teams with individuals who possess the strong technical background, knowledge, and skills to conduct this kind of data-driven analysis. In order to broaden the set of experts that are able to provide guidance and insight into the analysis, the selected country may consider establishing a steering committee for the constraints analysis process. A committee of local experts from relevant ministries, academia, the central bank, and other organizations can provide a forum for progress checks, input, feedback, and eventually sign-off on the constraints analysis. The steering committee is not obligatory, but the selected country should consider how best to ensure accountability and build broad country ownership of the results. MCC’s experience has been that the constraints analysis process works best when it is led by a team of country nationals with relevant experience and expertise who can devote full-time resources to their tasks. Though it is not recommended, nor is it MCC’s experience that it improves – on average – the quality of the analysis, a selected country may also draw upon international resources throughout the constraints analysis process, as may be appropriate. If selected countries choose to take this route, they should consider how to build “ownership” of an analysis that may be seen as being produced by outsiders. Planning: MCC will send an economist, a gender and social inclusion specialist, and private sector development specialist, along with other members of its country team, to discuss the details of the constraints analysis methodology and the process for undertaking a complete constraints analysis assessment as soon as possible after a selected country identifies and appoints its National Coordinator and economist. To ensure thorough, timely implementation of the assessment, the selected country should also appoint the other members of its constraints analysis team as soon as possible. Together, MCC and the constraints analysis team will discuss and agree on a comprehensive work plan that includes the specific questions to be addressed, the relevance and applicability of any existing analyses of constraints to growth and poverty reduction, additional key sources of data and information to be consulted, and a sequence of steps and an overall timeline for the entire process. The teams should also agree on a plan for consultations as the process unfolds. Data collection: During its initial technical visit, MCC will provide the constraints analysis team with all relevant data and information that is available to MCC, in an effort to facilitate the start of initial analysis. MCC may also provide brief issues papers that review available research on social and gender issues or business and industry issues. Following the initial technical visit, the constraints analysis team may need to review that data and information in order to determine if any critical pieces are missing and if the available data is sufficiently robust. The constraints analysis team may also need to identify, request, collect and review a substantial amount of additional data and information from sources that do not make their data publically available, including government agencies and external entities. The constraints analysis methodology requires information from many sources. To expedite the process and avoid duplication of efforts, the constraints analysis team should make maximum use of readily-available data sources and any relevant analyses of constraints to growth that exist. Gender, socio-economic, sector- or industry-disaggregated data should be used to inform or nuance information about constraints. Quantitative data can also be supplemented with qualitative evidence from consultations with relevant stakeholders, as discussed below. National poverty/social and gender policies, strategies, and indices. MCC can provide a Technical Annex to this guidance document that includes a list of commonly used sources for data and information for further consideration. The (shadow) price of the constraint should be highA relatively high price is indicative of high demand. Movements in the constraint should produce significant movements in the objective functionIncreasing supply of a potential constraint and observing an increase in a related outcome variable is indicative of pent up demand. Agents in the economy should be attempting to overcome or bypass the constraintIf supply is limited, but demand is high then economic actors will attempt to find alternative ways to access the factor. Agents less intensive in the constraint should be more likely to survive and thrive and vice versa. Hausmann, Klinger, and Wagner (2008) also provide further discussion and examples in their Mindbook that apply these principles of differential diagnosis in the context of the constraints analysis methodology. Broadly speaking, the constraints analysis methodology requires information on levels and trends with respect to a variety of variables and parameters, on both the microeconomic and macroeconomic levels, as well as qualitative evidence indicating the presence of constraints. Wherever possible, the constraints analysis team should provide evidence and data from diverse sources that reflect any systemic bottlenecks to investment. To expedite the process and avoid duplication of efforts, the team should make maximum use of readily available data sources and any relevant analyses of constraints to growth that exist. Wherever gender-, sector- or industry-disaggregated data are available, they should be used to inform or nuance information about constraints. Quantitative data can also be supplemented with qualitative evidence from consultations with relevant stakeholders. The constraints analysis methodology also requires comparisons between similar countries. To the extent possible, the constraints analysis team should benchmark the performance of the selected country on the same variables and parameters against a set of comparator countries that are carefully chosen based on their similarities in regional location, size and economic structure, resource endowments, similarity of production or export baskets, level of economic development and/or reform history. Such comparison helps the selected country more clearly identify areas ways in which it may lag, and the comparisons may suggest improvements that the selected country can reasonably achieve or identify levels of economic performance to which the selected country can reasonably aspire. Using the average values of a large subset of countries (say low income Asian countries) can help ensure that conclusions reached in the constraints analysis are not overly dependent on the choice of a few, specific comparator countries. When considering any element of the decision tree, the analyst is faced with the question: “If this is a binding constraint to growth, what effects might I be able to observe in the economy?” To answer these diagnostic questions, selected countries must: (1) select and formulate specific diagnostic questions in a sensible way that reflects their unique country context; (2) research and marshal data and other information that shed light on the questions; and (3) answer the questions in a systematic manner, given the balance of available evidence. In the process, the constraints analysis team should identify, consider and incorporate appropriate data and information related to social and gender inequalities and key industries, along with their implications for growth and poverty reduction. MCC’s country team is available to provide advice and assistance with the design and execution of the constraints analysis where necessary to ensure that results are defensible and sound. Determining binding constraints is not, as noted above, necessarily a simple or straightforward task. Since most countries are characterized by scarce resources and less than optimal policy environments, there are typically many factors that constrain private investment and growth. Such an analysis requires knowledge specific to the economy, careful analysis of available data and creative application of diagnostic tests, benchmarking with comparator countries, and careful vetting with stakeholders. To achieve this goal, the constraints analysis must be conducted using reliable information and data and must incorporate, where feasible and appropriate, social and sectoral analysis that deepens the analytical understanding of how constraints affect growth and poverty reduction. A good constraints analysis will incorporate microeconomic, macroeconomic and sector-specific data to determine binding constraints. The constraints analysis report considers additional information that reflects specific concerns about: (i) social and gender inequalities that may characterize the economy or shape policies and institutions, and (ii) business issues that may influence contributions to private business activity and economic growth. Including these perspectives helps ensure that any conclusions about binding constraints are based on a complete understanding of the country’s economy, its growth, and how the benefits of that growth are shared. Where relevant, social and gender and sector-level and industry-level analysis should inform the results of the tests. In order to conserve resources and focus on what is most important to the analysis, the constraints analysis team should take a preliminary examination of all branches of the diagnostic tree to eliminate some areas from further consideration, i.e., those areas that are unlikely to rise to the level of a binding constraint. The constraints analysis team should then focus their analytical effort on those nodes of the diagnostic tree that are more likely to emerge as binding constraints to growth once further analysis is done. These are the constraint areas that will require the greatest analytical rigor and consideration in order to rank constraints and identify those that are most binding. When the constraints analysis team reaches preliminary conclusions about binding constraints to economic growth, it should discuss the results with the MCC country team. Ultimately, the constraints analysis team and MCC must reach agreement before progressing into the last stage of consultations, finalizing the constraints analysis report, and moving on to the next phase of the compact development process. Consultations: The constraints analysis team should undertake consultations with experts and other stakeholders at various stages of the constraints analysis process. During MCC’s initial technical visit, the MCC and selected country teams should consult with ministries, executive departments or other entities that compile, own or control data the teams will need in applying the constraints analysis methodology. Such consultations may include national ministries of finance, transportation, public works, energy, education, health, labor, trade, agriculture, social or community development or gender, the central bank, the bureau of statistics, and local chambers of commerce or specific businesses, or business associations or civil society organizations. Through these consultations, the constraints analysis team should share information on the constraints analysis methodology, the data and information required and how the data and information will be handled. In addition, the constraints analysis team should establish a point of contact through which to channel communication and requests for data. After a work plan has been established and key information needs have been identified, team members may begin collecting additional data through interviews or focus groups with experts or representatives of specific demographic, social, professional, or occupational groups. The constraints analysis team can use feedback from these stakeholders to identify additional concerns and to adjust its preliminary findings. This information is useful and necessary for the analysis, but caution should be taken not to place too much weight on the consultations as the sample is not likely representative of the population overall. The constraints analysis team should undertake a subsequent set of consultations after its preliminary analysis of the available data and information has ruled out certain potential issues or concerns. The constraints analysis team should identify key questions that are necessary to address in order to complete the constraints analysis. These consultations should target stakeholders who can provide information and/or evidence that the constraints analysis team could use in order to deepen the analysis, rule out additional constraints, and arrive at near-final results. These consultations should investigate how stakeholders in different groups perceive constraints; provide additional information that can strengthen the analysis; and/or resolve outstanding questions or explain conflicting information. Consultations may involve a variety of stakeholders, including those in different regions of the country (perhaps representing urban and rural areas, or coastal and inland areas), those in formal and informal business enterprises, women-run businesses, civil society organization, internationally-owned firms, and those active in different sectors and industries. For these consultations, the depth of discussion may be more important than the number of respondents in each category. For that reason, individual or small group discussions are likely to be preferable to large roundtable meetings. Consultations should be jointly planned and agreed upon in advance by the members of the constraints analysis team. The team should generate lists of targeted questions or themes for discussion for each stakeholder consultation in order to ensure that all topics of analytical interest are covered in a single session – economic, private sector, social – to the extent possible. Where possible, all constraints analysis team members should be present for consultations to ensure that team members are extracting the information that is relevant to their particular analytical lens. It should be possible to interview a large number of stakeholders over the course of several weeks. The constraints analysis team can use feedback from these stakeholders to identify and research additional information and data. Finally, the constraints analysis team should undertake a third set of consultations after it has reviewed the conclusions on a set of binding constraints or prepared an initial draft of its constraints analysis report. Such consultations may take place at various locations across the country and involve a broad set of stakeholders, to include non-governmental/civil society organizations, and community-level participants. These consultations help disseminate information about the results of the constraints analysis process, but they should also provide validation and general agreement on the binding constraints. The consultations may also provide further nuance to the conclusions or highlight prioritization or even disagreement among various groups affected by the binding constraints. In this way, feedback from these consultations may be relevant in the next stage of compact development, as the selected country begins to examine the binding constraints in greater detail. Drafting the Constraints Analysis Report: As a general rule, the economist will manage the process of sorting data and information and writing the final constraints analysis report, with participation by the other team members. To support that process, the team should, as early as possible, develop an outline for the report that emphasizes conclusions regarding the binding constraints while integrating a range of insights and findings on social and gender and industry level issues. The team may also begin with a visual presentation instead of text documents to document and communicate its analysis. The final constraints analysis report should include, at minimum, three general sections: a context section, the diagnostic tests, and a synthesis or concluding section. The context section should include a history of growth and poverty reduction of the country that details and explains key drivers of past growth and the distribution of that growth in the country’s specific context. The diagnostic tests section should apply the constraints analysis methodology and present evidence used to determine whether a potential constraint is binding or non-binding, with additional contextual data and consideration for whether and how the binding constraint(s) affects certain economic sectors of interest or its effects are felt differentially among social groups. The synthesis or concluding section should, to the extent possible, delve into the underlying causes of the identified constraints and consider the potential to relieve the constraint and impacts for growth and poverty reduction if the constraint were to be relieved. In many cases, the constraints analysis team may begin writing initial drafts of the report even before it has finalized its identification of the binding constraints to economic growth. It may wish to draft sections of the constraints analysis report on an iterative basis by seeking discussion and feedback on preliminary findings and conclusions from the MCC country team or by seeking guidance on additional data and information. Wherever relevant, the report should reflect context provided by the social and gender information and sector-level and industry-level information that the constraints analysis team has collected and analyzed. The final version of the report should also incorporate feedback from the last round of consultations and, for that reason, may not be produced until after the six month target. Although the constraints analysis may be developed collaboratively, the selected country should “own” the document, which will form an important basis for additional work during later steps in the compact development process. This generally means that the constraints analysis team should take the lead on designing and conducting the analysis and assume responsibility for its results. Additionally, the analysis should be understood by a diverse group of stakeholders, and effort should be made to socialize the results across a wide-cross section of the country and build broad-based support for its findings. Once it is finalized, MCC strongly encourages that the selected country make the final draft of the constraints analysis report publicly available on the internet.